In the past, oxen were an important asset for Korean farmers and it was very rare for ordinary folk to have the luxury of eating beef as the oxen had to farm the land and beef was exorbitantly priced. In those days, beef dishes could only be eaten at wedding feasts or other celebrations. Even at those events, not a single part could be wasted. Oxen heads, tails and leg bones, were used to stretch the dishes that could be made. 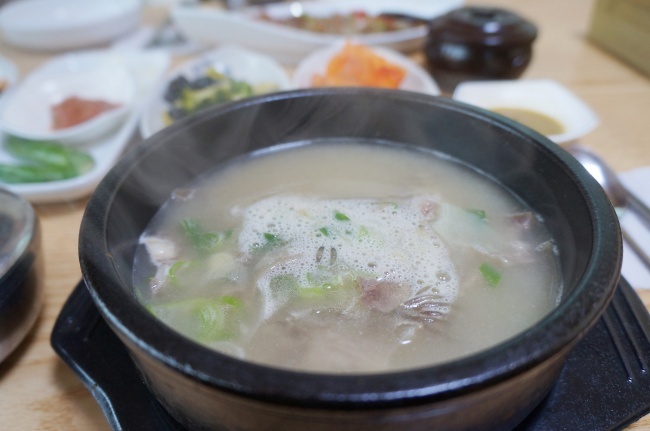 Those parts did not have much meat, so Koreans used them to make soups, pouring a great amount of water into the cooking pots. This is the origin of someori gukbap, or ox head rice soup. The name could be intimidating, evoking an image of an ox’s entire head in a soup bowl. But the meat is deboned from the head and is sliced into an edible size. One won‘t be able to tell the soup stock, in fact, by just looking at it. The soup is broiled with ox bones, simmered for hours on a low flame. The long hours of patience create a milky soup with a lip-smacking rich taste. A bowl of rice poured into the soup creates a hearty, humble meal. Those who are not used to the soup can be startled by the watery taste of it. Though it is seasoned with salt before eating, the taste is mild compared to other Korean dishes. But after finishing the bowl, one is filled with unexplainable energy. The meat inside the soup is chewy with an abundance of collagen. Braised beef is also used in the soup, offering a feeling that the diners have just eaten a whole ox. Variations of the ox soup are consumed daily, such as the ox tail soup or the beef bone soup. It is an everyday meal for many, especially preferred on chilly days.